(Nanowerk News) Single-atom catalysis is an emerging frontier of catalysis. However, there are still many fundamental issues that need to be addressed. For instance, can the atomically dispersed metal catalysts exhibit better catalysis than surface atoms of their nanoparticulate counterparts? Why atomically dispersing same metal atoms on different supports often leads to the catalysts with distinct catalytic performances? Are the active sites of atomically dispersed catalysts limited to the dispersed metal atoms alone? A recent study (Science Bulletin, "A vicinal effect for promoting catalysis of Pd1/TiO2: supports of atomically dispersed catalysts play more roles than simply serving as ligands") revealed that, besides serving as ligands to stabilize single-metal atoms, support also provide metal atoms that are vicinal to catalytic metal atoms and can directly participate in the activation of reactants, thus creating a significant vicinal effect for promoting catalysis of an atomically dispersed metal catalyst. On the basis of their previous work (Science, 2016, 352: 797-800), the authors investigated the catalytic performances of two atomically dispersed catalysts (supported on TiO2 of different surface properties) that have distinct local coordination structures. They found that the two catalysts displayed significantly different catalytic performances although their electronic properties were quite similar. 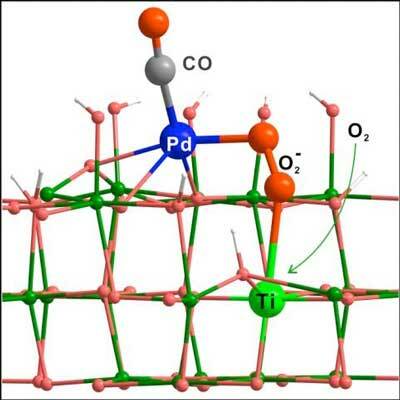 Their systematic experimental and theoretical calculations revealed that the atomic Pd-O-Ti(III) interface on the TiO2-supported Pd single-atom catalyst readily activates O2 into superoxide at room temperature to promote the catalytic oxidation of CO at low-temperature. Such a unique oxygen activation pathway also made the catalyst highly active in the oxidative combustion of green-house gas (i.e., methane) and harmful volatile organic compound (i.e., toluene). The most challenging part of the study was to identify the atomic structure of Pd-O-Ti(III), which was however nicely addressed by the extensive collaboration among Xiamen University, Institute of Physics at Chinese Academy of Sciences (working on atomic-resolution electron energy loss spectroscopy), the Shanghai Synchrotron Radiation Facility and Dalhousie University (working on X-ray absorption spectroscopy), and made it possible to fully understand the catalytic mechanism at the molecular level. As well demonstrated by the study, the active center of an atomically dispersed metal catalyst should not be limited to the dispersed metal atoms alone. It is fully possible that the support's metal atoms vicinal to the catalytic metal centers can be involved directly in the catalysis, thus playing an important role in promoting catalysis. In other words, the metal atoms on support can be part of the catalytically active centers. Therefore, in the design synthesis of efficient atomically dispersed metal catalysts, the influence and thus importance of metal precursors, supports and preparation should not be ignored. The finding in this work nicely helps to address why the catalysts with the same metal atomically dispersed on different supports can sometimes display significantly different performances in the same reactions. Meanwhile, some phenomena (e.g., the promoting effect of alkali metal ions, the importance of pre-catalysis reduction process) observed in the catalysis community can also be understood from the perspective of the vicinal effect. This study should provide theoretical guidance for the rational design and synthesis of efficient atomically dispersed metal catalysts, and also push more studies towards understanding catalytic mechanisms at the molecular level.